IGD’s Sentinel+™ 2-Wire protocol uses a 2-core cable for both data and power communications. Besides fewer terminations, the Sentinel+™ 2-Wire protocol does not require polarity for its connections, which means fewer errors and faster installation. Cable terminations are reduced. IGD’s Sentinel+ 2-Wire protocol enhances reliability. With just two wires for power and communication, current systems can be easily upgraded without changing cabling with the option to easily incorporate more detectors where needed. The Sentinel+™ 2-Wire protocol uninterruptedly monitors data between connected detectors and the system controller guaranteeing maximum system availability. I/O points can be easily integrated where needed for alarm and interface to other systems, distributing the logic where it is required with minimal cabling. When customers purchase an IGD product, they are purchasing 100 years of expertise. The 750 Series 2-Wire detectors monitor for more than 400 harmful gases and vapors. 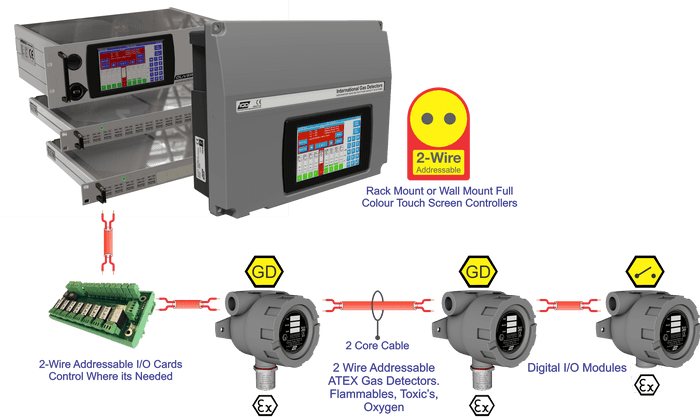 Approved to the most recent ATEX/IECEX standards, the 750 2-Wire series gas detectors offer critical safety for gas detection in dangerous areas. The system is easy to deploy by CompEx trained Site Electricians or Instrument Engineers. In case customers do not have in-house install capability then IGD can help there too, use IGD’s Engineers for installation. IGD’s full range offers protection for all gas hazards.